Having a smaller, more intimate group with whom to practise life modelling and instruction therein is a most gratifying bonus. It can be a safer place to start a journey towards more intense life modelling. There is even the possibility to practise posing without having removed clothes. There is not the usual atmosphere of focused concentration, since several participants are not primarily concerned with drawing even though they are giving it a go. Also Lucy and I are apt to cut in and mention during a pose something pertaining to it or ask the models how they are finding it. Between poses as well we bring up different matters relating to posing, and each new pose is introduced with an idea, for example, energetic connection between models rather than physical (models rarely pose alone) as well as a theme. We may try for a naturalistic pose or a more abstract one that is centred on form rather than gesture. Models sometimes come with their own ideas too, especially those with some experience. Indeed last time Richard Moon took part who has modelled for many years and he was most excited as this is his first time in 15 years of modelling that he has had an opportunity to pose with others. Like Lucy he shares a passion for recreating ‘The Raft of the Medusa’, amongst other classical images. He even brings several sheafs of laminated images of poses to present to artists he may work with to help them pick out ideas they are keen to try. Like a catalogue one artist observed! Another development was the presence of a few experienced artists who were not there to model but to appreciate a variety of short poses by a number of models as well as provide some generally better quality art work. I think they also appreciate the unusual insight into the model’s experience as we talk through the nature of poses and demands of modelling. Lucy took some fabulous pictures of the art work and posted them on Facebook; http://www.facebook.com/media/set/ One particular picture of 4 models pretending to wait for a bus has become an instant favourite and I think it has been sold! Lily LeMaire the artist insisted it was just a sketch, but sometimes that is all it takes. The next workshop will be on Wednesday 28th November at Battersea Library again, 7 – 9pm. We look forward to seeing a range of models and some artists hopefully. Models posed mostly individually to begin with, and after the break they were more connected, in fact in tableaux suggesting some scene. There was a naked funeral, a naked wedding, a party… these only lasted for half an hour, so artists were pretty pushed to get it all down with 7 or 8 figures in each group. Some lovely abstract work too. I put some other pictures in the ‘Images’ page, but couldn’t figure out how not to get the new images muddled up with ones from last year… another time. Plus there’s lots more uploading to do. Just wanted to start this as I know how much people really want to see work from the recent event. Thank you to superb new & experienced models alike, they were a fantastic group, some sharing experience and others learning very quickly. Even for the pros though there is the novelty of being en group. Clifford, a seasoned pro pointed out that it is a very different experience to being alone as you are not supposed to be the star but instead part of an ensemble creating a striking pose together. Very true. When I decided to join life modeling for Spirited Bodies I wanted to experience something new, because it sounded very interesting, but I did not know how I could have reacted. The day before coming I was asking myself how I normally feel when people look at me and generally I assume a defensive pose and start to agitate. I thought that staying naked in front of lot of people would have been a little strange for me but finally I found it totally normal and natural and this surprised me. 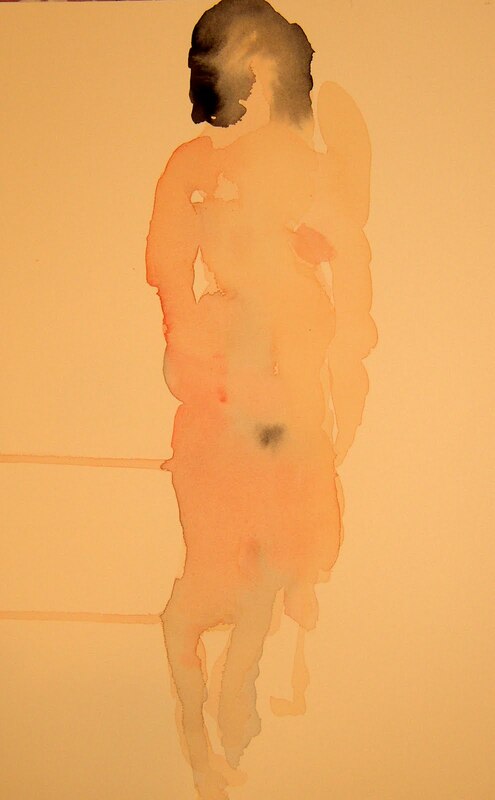 I liked to see real bodies becoming something different, losing their common shape and colour. I had the feeling that artists through us were finding space to something new, abstracting us, looking beyond what was there and having inspiration and challenging their imagination. I liked the atmosphere and people. The room was very silent and productive, everyone was literally in what they were doing. I don’t think that there was something missing or lacking; the heating was great and sometimes I was even sweating; there was water, tea, coffee and biscuits, the place was clean and most of all nothing was forced or imposed. The organisation worked perfectly, I have nothing to complain and also doing the meeting in advance was better. Just to make sure with who you was dealing. 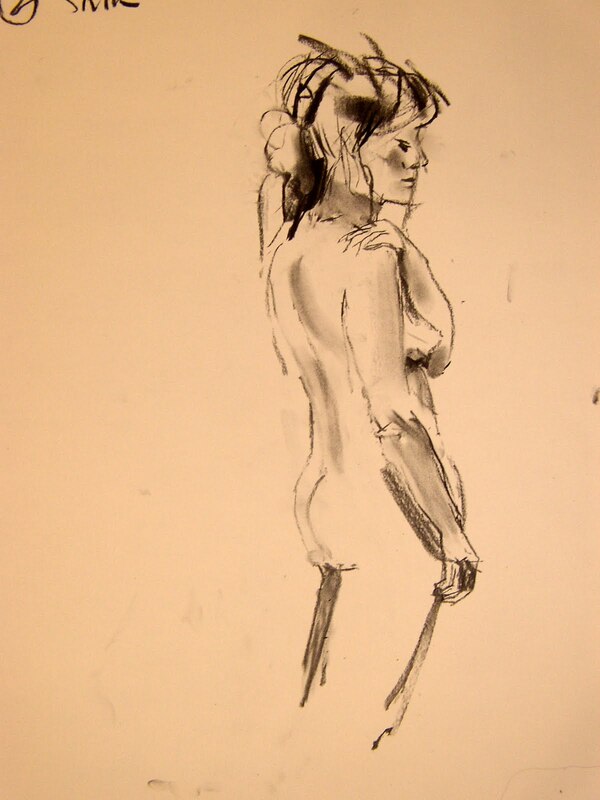 Yes I would like to do life modelling again either in a group or alone. It helps you to listen to your body and feelings and you have time to think a lot about whatever! I do not think that interaction is the proper word to explain what was involved between the artists and me. I am not meaning that the process was passive but there was not communication – instead a silent agreement of being the object that they were looking at and then becoming the subject of their work. For me it was a kind of lateral place where artists through the visual impact of the scene in front of them started their creative process. Yes, I did feel appreciated. 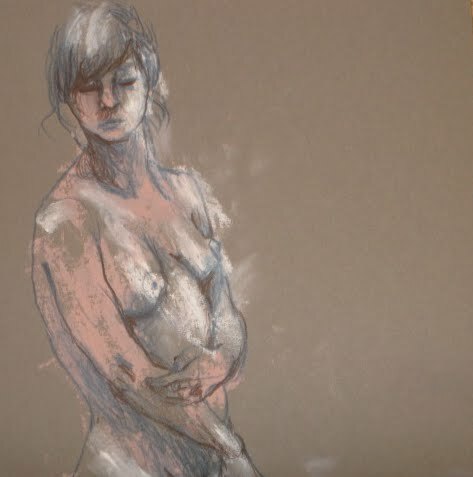 I never had any expectations of life modelling – I didn’t know if I’d love it or hate it; whether I’d feel shy or be unable to stay still for any amount of time. I had no idea of what to expect. I sort of just closed my eyes and dived in. I began to look in to life modelling a little more than 6 months ago. I was beginning to explore my own creativity and love for the arts. I have a deep respect for artists and, though I doubt my ability to hold a pencil, I wanted to be artistic in my own right, in a way I thought I could. I used to be a gymnast, I have an awareness of my own body and how my body expresses my emotions – through illness when I’m stressed, in my expressive or closed body language in different situations – but that awareness did not automatically equate to a consciousness, and rarely to control. Coincidentally, at the same time as I was beginning my own creative journey and recognition of my body’s expressive capabilities, I was feeling dissociated from the way my body looked. I felt unattractive, my body had changed since being a teenager – I was beginning to look more like a woman and I felt betrayed. What do you mean I won’t have abs of steel unless I exercise! Why do my curves have to wobble?! And where did that bottom come from?! I knew I was still petite, I just am that build but there was no denying my body was new to me and some how I ‘d have to learn to love it, or I’d be in for years of hell trying to regain my teenage physique. Meanwhile, I had been in touch with an artist and tutor from Kingston University who put me in touch with you, Lucy. I decided, what better way to reconnect with my body, to regain control and accept my new body than to take my clothes off in front of a bunch of strangers! I jumped in. Any trepidation I felt before stripping off disappeared the moment my robe hit the floor. This was something I could do and damn it, I would work and concentrate as hard as I can to let these artists know a story about me. This idea of modelling being an opportunity to tell a story about me is something I keep coming back to. Each session I model I find a theme emerges from the first pose. That then dictates what kind of pose will follow and so on, until I have re-enacted (or just acted) frozen images from previous (or fantasy*) experiences. A whole session allows the kind of freedom of expression I rarely get verbally. I use the language of my body to reconnect with my own thoughts, feelings, memories and try to send those stories out to any artist who might be ‘listening’. There are times I leave a session feeling, though exhausted, rejuvenated. It is a cathartic, cleansing experience. I seek to connect with an artist in a non-verbal way where they hear my story and it stirs something in them and they draw accordingly. A synching of experience. I am a singer and this same ‘synching’ can happen at times musically too. This is when you get the ‘buzz’ and you can feel it coming off all the musicians performing too. There have been times where I’ve come close to this experience through modelling and it is that feeling that I continue to seek. That drives me to concentrate and work hard at each session and to hope for a commission with an artist I connect with in such a way. I would love to be part of a working-relationship to achieve a picture which is an insight into both the artist and the model. Achieved by collaboration. My preferred length of pose is about 20-30 minutes – at this time I ache enough to have to fight for it, not so much I begin to hate it! I find it is long enough to both test and train my concentration on that ‘tableaux’ that is in my head. 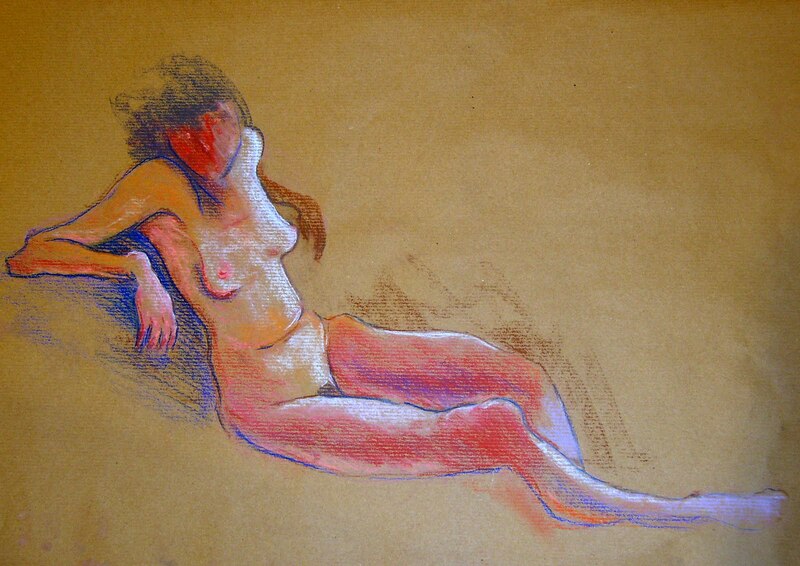 *I want to make a point about life modelling being very removed from a sexual nature for me. I try to express my inner ‘Gaia’ rather than, well you know. I feel nakedness has an innocence about it that is too often forgotten and yes sometimes in nakedness we are sexual beings but I try to avoid being provocative as it’s not something I’m comfortable with. I feel the need to raise this because so many friends (even artists!) think that it is of a sexual nature. So far the one with the greatest understanding, who I told of my ambitions most fearfully, has been my Mum! She is even considering having a go herself.